On February 6, 2018 in St. Petersburg, Florida, three members of a Civil Affairs Team of the 92nd Civil Affairs Battalion (Airborne), 95th Civil Affairs Brigade, and an adviser, engaged in a mission readiness exercise with Lisa A. Mets, the Immediate Past Estonian Honorary Consul (St. Petersburg); and Maare Kuuskvere, Markus and Liisa Larsson, Erkki Taada, and Triin Karr, all members of the Estonian Society of Central Florida (Kesk Florida Eesti Selts). A mission readiness exercise engages members of a civil affairs team with diaspora community leaders to learn more about the ethnic experience of the diaspora community and to learn and practice cultural sensitivities. This is the third time a civil affairs team assigned to Estonia has worked with the St. Petersburg Estonian community on a mission readiness exercise. 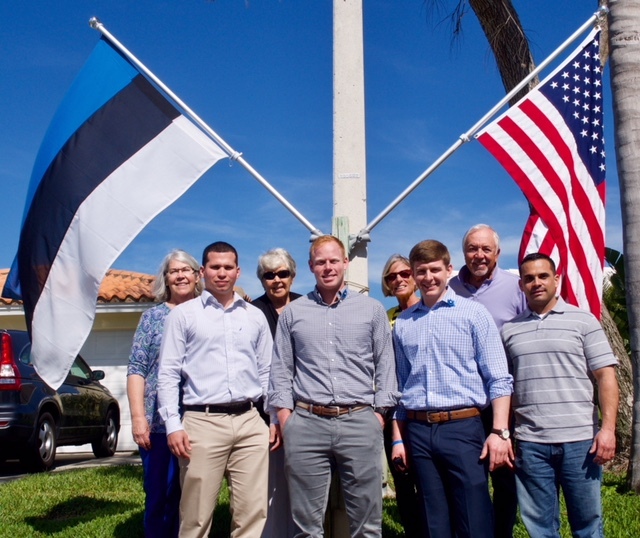 The program introduced the Civil Affairs Team to Estonian and Estonian-American perspectives through three generations of Estonians that live in Tampa Bay: those born in Estonia before World War II, who were refugees with experience in displaced persons camps; those born and raised in Estonia under Soviet oppression; first generation Estonian-Americans whose lives have been committed to preserving Estonia’s sovereignty; and those who were teenagers in Estonia when Estonia regained independence in 1991 and now make Florida their home. A whirlwind orientation program covered Estonian geography, history, demographics, government, economy, Estonia’s place in international rankings today, language, educational system, culture, and e-Estonia. To introduce the Civil Affairs Team to Estonian cuisine, refreshments included traditional Estonian breakfast võileivad, a Jaanipäeva-style picnic lunch, and a traditional Estonian Christmas dinner with homemade verivorst. The following day the Civil Affairs Team visited Eckerd College in St. Petersburg, the workplace of the Immediate Past Estonian Honorary Consul. In two sessions, the Civil Affairs Team learned about emergency preparedness planning and the student-run marine rescue program, which is called Eckerd College Search and Rescue (EC SAR). “Secure the victory” is the motto inscribed on the pin worn by the members of the Civil Affairs Team. That describes perfectly their role in Estonia helping Estonia to preserve its independence. Those who hosted this experience consider it an honor and privilege to engage in mission readiness exercises and stand ready to continue to serve in this way. On behalf of all Estonians in Estonia and the diaspora, we express deep gratitude to the USA for its continuing support for Estonia.